This 1200-gallon Corrugated Metal Pipe system was installed in two phases in 2013 by Byron Berry, Maintenance and Operations Manager, and building construction students at Cochise College under the direction of Instructor Alma Hunt. The system consists of two 660--gallon linked tanks that supply water for landscape plants. 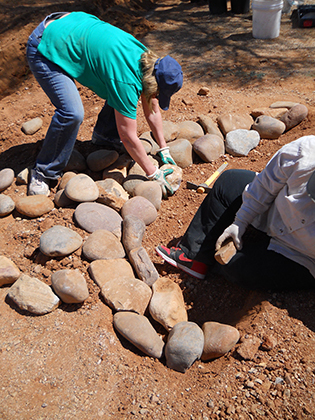 Assistance was provided by the Upper San Pedro Partnership and the University of Arizona Cochise County Cooperative Extension Water Wise program. The facility, the Naco Border Patrol Station. The key design criterion: sustainability. 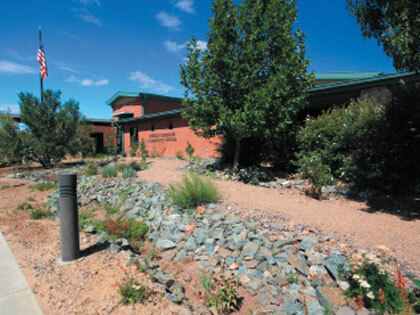 The station was equipped with a BRAE rainwater harvesting system because in the Chihuahuan desert, every drop of the life-giving natural resource counts. and grass and also to flush toilets inside. series of strainers, the water continues into the subterranean storage tanks. submersible pump in each of the tanks, the Rainset™ at Naco includes a dual pump system with two, five-HP pumps to boost water pressure for toilets and the sprinkler system. Monitoring, pump and cleaning controls are also mounted on the skid. Bisbee is a small community of 5,000 residents nestled in the Mule Mountains in southeast Arizona. Average annual rainfall is 18” and primarily falls in torrential monsoonal downpours in July, Aug and early September, and in gentle rains during the winter months. Spring is windy, hot and dry. painted on the tanks. Gutters were installed on the ramada that not only directed rain into the tanks but also reduced flooding problems in the park and property damage on the offices below the park. This project was funded with grants from the Cochise Community Foundation, the Upper San Pedro Partnership and the Bisbee Bloomers. In-kind-service was provided by the city. A dry delivery system (downspout directly to tank) from the west car covered parking area and a wet delivery system (downspout goes along the ground then up into the tank) from the east car covered parking system collected in a 3,000 gallon welded galvanized metal tank. 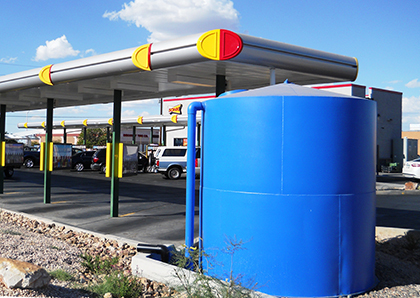 When this Sonic Drive-In was remodeled, the owners like other community businesses, also wanted to preserve groundwater supplies by using rainwater instead of groundwater for irrigation. They contracted to have a 3,000 gallon welded galvanized steel tank (painted a beautiful blue color!) installed with an external pump so pressurized rainwater could water their landscape. The collection area catching the rain isn’t very big at 600 square feet, but more downspouts can be directed to the tank. With the system Sonic has now, it is estimated that they can reduce their groundwater use by almost 5000 gallons each year. Passively harvesting 450,000 gallons of stormwater with “earthworks” from sidewalks and parking lot, and actively storing rooftop rain in 10,000 gallon tank. Passive harvest: The area between the Sierra Vista Police Station and City Hall receives thousands of gallons of stormwater each year. Before the Watershed Management Group’s (a Tucson non-profit) earthworks retrofit project, the unused stormwater by-passed irrigated plants and drained to a detention basin - another example of paying for water while getting rid of water! The disposed stormwater also caused erosion cuts. A series of berms (bumps) and swales (dips) installed by community volunteers harvests the stormwater from the Police Station parking lot, an area approximately 55,000 square feet in size. It is estimated that annually, the earthworks will harvest 450,000 gallons of pollutant-laden stormwater running off the parking lot. In addition to the parking lot run-off, the swales and berms collect stormwater run-off from the hard surface areas surrounding the Police Station. We influenced the architects of the building to consider a “butterfly” profile which provided a south exposure for the PV panels, it also allows all the roof water to drain at a single point without the use of guttering forcing the water to an up gradient direction using gravity to passively irrigate the landscape. And recharge the creek. This also presented an opportunity for a capturing funnel which reduced the erosive energy of the falling water and celebrates every storm with honor & artistic expression. Split system. The landscape in the courtyard was designed with the water demand in mind. The fruiting trees, shrubs and grape vines are irrigated with this isolated 5000 gal. pressurized system. The 3000 gal. pressurized system was designed to meet the demands of the vegetable garden only. The balance of the exclusively native species landscape is irrigated with municipal water for a two year establishment period only. irrigate the plantings during storm events. During dry times the tanks water was pressurized and connected to the drip system and used primarily for establishment and during extreme drought. Remote seasonal mountaintop home with a failing well. We set up the rainwater collection system as the primary water source with well as back up. Re-guttering and snow stops were required because of the alpine conditions and tree density of the site. The local fire district was consulted with prior to the design and install. Owner also has a generator for power back-up. First phase-passive, future phase-active. A master plan approach to the entire core campus took into account all existing and future hardscape surfaces to collect precipitation and deliver it to native & edible landscape beds which were graded as basins to receive the runoff making the passive collection the landscapes primary long term irrigation supply. The original scheme was to go Net-Zero water having the Rain system provide 100% of the facilities water demand. Local health code inspection cost made this prohibitive. The revised system meets all the landscape water needs. 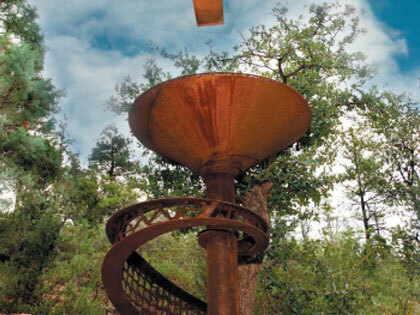 An impressive sculptural funnel elegantly captures water from the roof scuppers. The overflows are plumbed back into landscape for passive irrigation. Multiple landscape basins graded to maximize run-off capture assisting with stormwater mitigation. and improve the water quality of Watson Lake and its tributaries. Other goals: Public outreach/education and neighborhood building. planter drains with variable water quality, vortex pre-filters, float valve - city make-up water, 1 hp. Submersible pump connected to irrigation system, overflows plumbed back into roof drains. excluded from the ‘tank’ footprint. Internal 3” roof drains were intercepted just above grade with custom rainheads. Tank volume was dictated by landscape water budget. 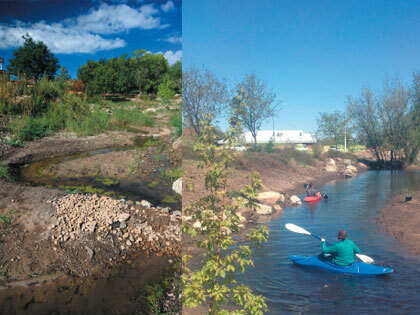 landscape attenuate storm surges and clean run-off. and active and passive rain systems were integrated and featured in the front yard of the town hall with this interpretive sign. Water budget basis: municipal water for establishment (2 yrs.) and rainwater for maintenance period (life of plant). 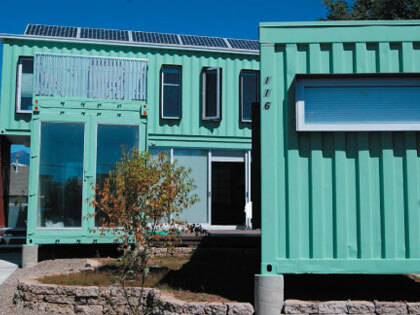 Integrated passive/active rainwater harvesting for repurposed shipping container home. System completely designed but never implemented. The rainwater system consists of three 1700 gallon (5,100 gals total) underground tanks that stores the roof collected rainwater for the school’s outdoor irrigation system. Water flows from the roof to a poured in place concrete holding vessel with a built in basket filter prior to entering the underground tanks. Students are afforded a glass window inside the school that allows them to observe the flowing water during rain events connecting them to the system. Water is then pumped and filtered to an outdoor control station located remotely to the main cistern storage. A bypass solenoid vale downstream of a backflow preventer is controlled via pressure transducer that allows municipal water to be introduced when site-collected rainwater is not available.